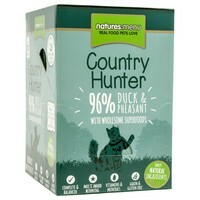 Natures Menu Country Hunter Cat Food (Duck and Pheasant) is a complete and nutritionally balanced meal packed with high quality protein, superfoods and essential vitamins and minerals. Made with 96% succulent Duck and full-flavoured Pheasant with added Blueberry, Cranberry and Spirulina, Country Hunter Pouches for Cats also include Catnip, Yucca and Green Tea Extract for an added boost of natural nutrition. Each recipe is filled with only top quality raw ingredients that have been sealed and then steam cooked to lock in all the goodness, and are a great alternative to raw feeding when travelling or staying away. Natures Menu Country Hunter contains no nasty meat meals or derivatives, artificial colours or flavourings, and are Grain and Gluten Free.